Shimano have launched a brand new Ultegra groupset, 6800. The new gear contains masses of trickle-down from Dura Ace 9000. Grabbing the headlines will be addition of an extra cog to give 11 speeds at the rear, but the improvements to the shifting and braking performance are more worthy of note. “Ultegra normally takes the latest technology from Dura Ace and provides it at a much more competitive price”, Shimano’s Mark Greshon told us. “It’s for real world riders who want good performance.” Certainly Ultegra has been a staple groupset for privateer racers and keen sportivistes for many years, offering much of the functionality of the top-end transmission components. Dura Ace jumped ahead last year with the release of the 9000 groupset, but Ultegra is back snapping at its heels now. “Ultegra uses technology that’s been proven in WorldTour races, proven at the highest level”, said Mark. However, Shimano are aware that not everyone riding Ultegra has racing ambitions. All day comfort is important, and there’s a large percentage of Ultegra riders who spend most of their time riding on the hoods. Shimano have been thinking about comfort, and braking and shifting performance predominantly from that riding position. The lever stroke is shorter than before, and lighter too, meaning less shifting effort, and like Dura Ace 9000 the new drivetrain evens out the force required across the cassette, meaning that shifting in the low gears is as easy as it is at the bottom of the cassette; vivid indexing, Shimano call that. Hood shape is borrowed from Dura Ace mechanical, which in turn took its cues from the Di2 lever. It’s a lot slimmer than before which Shimano say gives better grip and comfort; certainly Mat was a fan when he tested Dura Ace. “I’ve got large hands and I find the reduced size to be an advantage”, he said. “People with smaller hands are likely to notice it even more”. 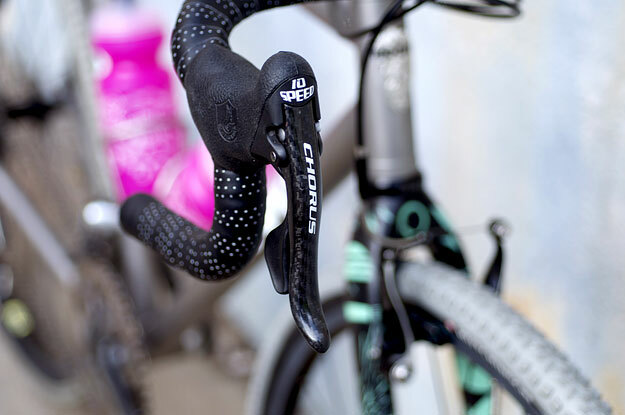 The brake lever is carbon, as it was on the mechanical version of the last Ultegra groupset. 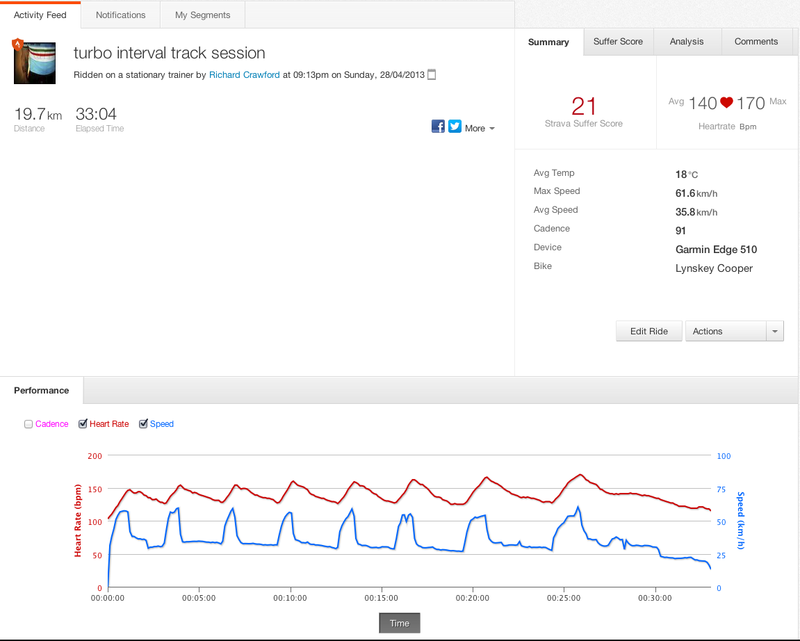 The Di2 version was alloy. The front derailleur has seen a significant change in design. It now features a support bolt, like Di2, that comes into contact with the frame to stiffen things up. The pull arm is much longer, like Dura Ace, to reduce shift effort. The rear mech comes in short- and mid-cage incarnations; you’ll need the longer mech if you plan to run 32 teeth at the rear, which is the largest cog it’s designed to handle. Again, it takes technology from Dura Ace 9000 down to the next level, with the more linear spring rate for more equal shifting across the block. Both mechs are designed to work best with Shimano’s new polymer-coated gear cables. For braking there’s the new symmetrical dual pivot design, ported from Dura Ace 9000. Instead of using the brake mount as one of the pivots the calliper has two independent pivots equally spaced on either side of the brake. Polymer-coated cables reduce friction and increase the amount of power for a given force at the lever. 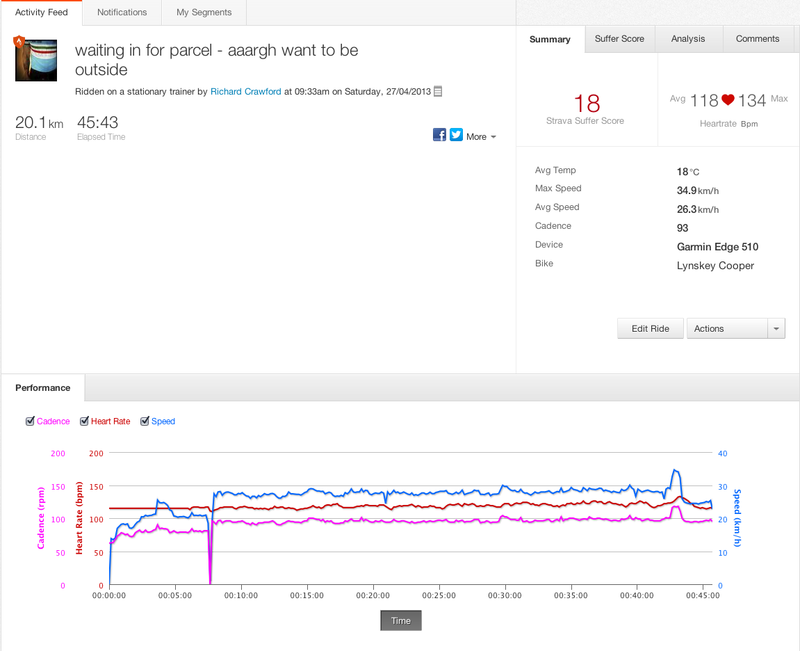 The upshot of these improvements is that Shimano claim a 10% increase in braking power over Ultegra 6700. 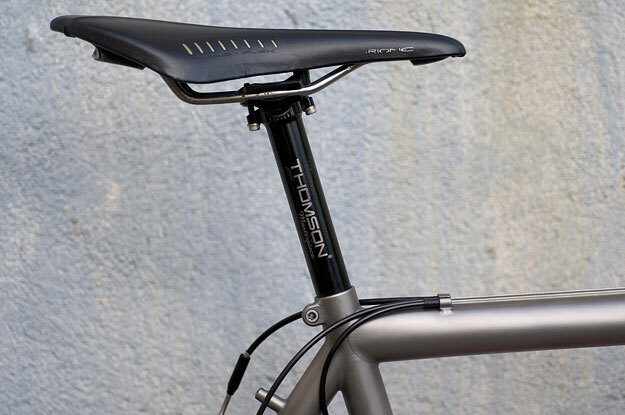 There’s a direct mount version of the brake available that does away with the central mounting bolt and instead bolts directly to the frame at either side, which is better for stiffness; quite a few frame manufacturers are already adopting the standard. Mat called out the performance of the new Dura Ace callipers as a highlight of the new 9000-series kit. “The amount of bite on offer is one of the best features of the entire groupset, and it’s incredibly easy to apply – you require very little effort through your fingers”, he said. “And the more powerful the braking, the longer you can safely leave it”. Hopefully the Ultegra 6800 callipers will be just as capable. Rider Tuned is how Shimano describe the available gearing options. “The groupset has been designed to be as efficient as possible, so that all your energy goes into moving the bike forwards”, Mark told us. We’re pretty sure that’s always been their policy though. Bascially you can have anything from a full-on race setup with a standard chainset and a straight-through cassette, to a compact and a wide-ratio block at the back. 53/39 and 50/34 chainsets are available of course, but there’s also a middle-ground 52/36 option which was introduced on Dura Ace last year and is sure to appeal to anyone that wants to look like they’re sporting a standard setup but could do with some help on the hills. Pretty much everyone, then. There’s a 46/36 cyclocross-friendly option too. There’s no triple chainset at the moment, but one is in development. The chainset has the new four-arm design from Dura Ace, which is designed to maintain stiffness but reduce weight by moving the arms to cope with the different forces at different parts of the pedal stroke. It’ll spin on a redesigned bottom bracket that shaves 14g off the old Ultegra one. The cassette is available in 11-23, 11-25, 12-25, 11-28 and 11-32 configurations. The additional sprocket means that the cassette is straight through for a bit longer, so generally that’s the addition of an 18T cog over ten speed. The new wider cassette means a new Ultegra wheel too, the WH-6800. This wheelset features a tubeless-ready rim, wide-flange hubset and tool-free hub adjustment system, as well as the wider 11-speed freehub, designed to take the extra torque possible from a 32T rear cog. A tubular version of the wheel will also be available and they’re all hand-built in Shimano’s own factory. The chain is redesigned for 11-speeds; it’s symmetrical so you don’t have to worry about which way round you fit it, which is good as we always got that wrong. 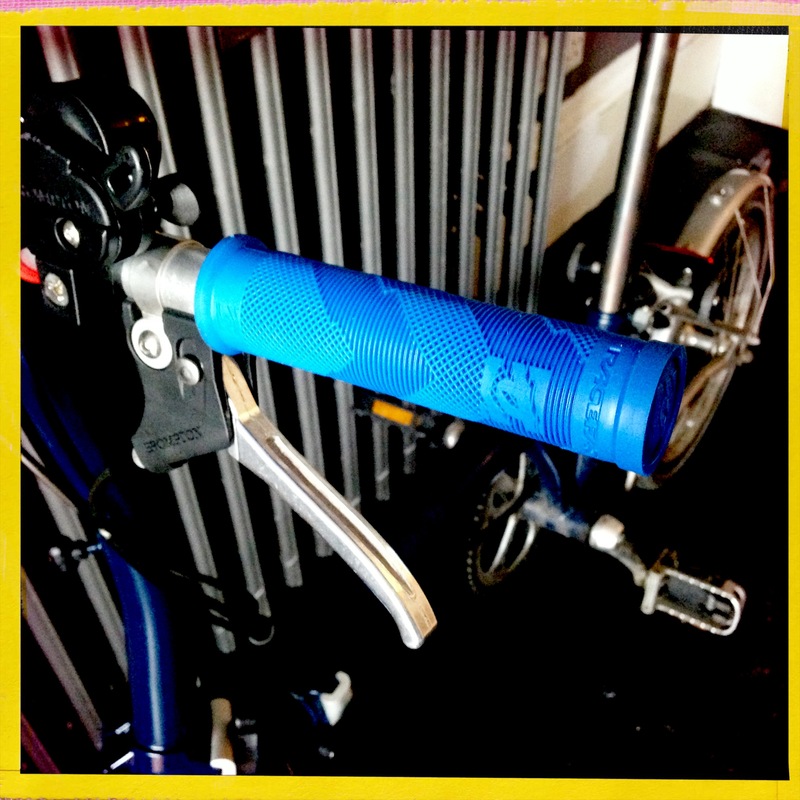 It also features a PTFE coating, called Sil-Tec, for increased durability. The Ultegra pedals are unchanged, save for a cosmetic update. We saw the groupset a few months back, and also got to have a quick play on the prototype shifters and mechs. It quite literally was a spin round the car park, so not enough to get a proper feel for the groupset, although first impressions were positive. We’ll be getting in a production version just as soon as we can. By the time I got to the lights 100m away I had already counted 6 so I rapidly gave up. 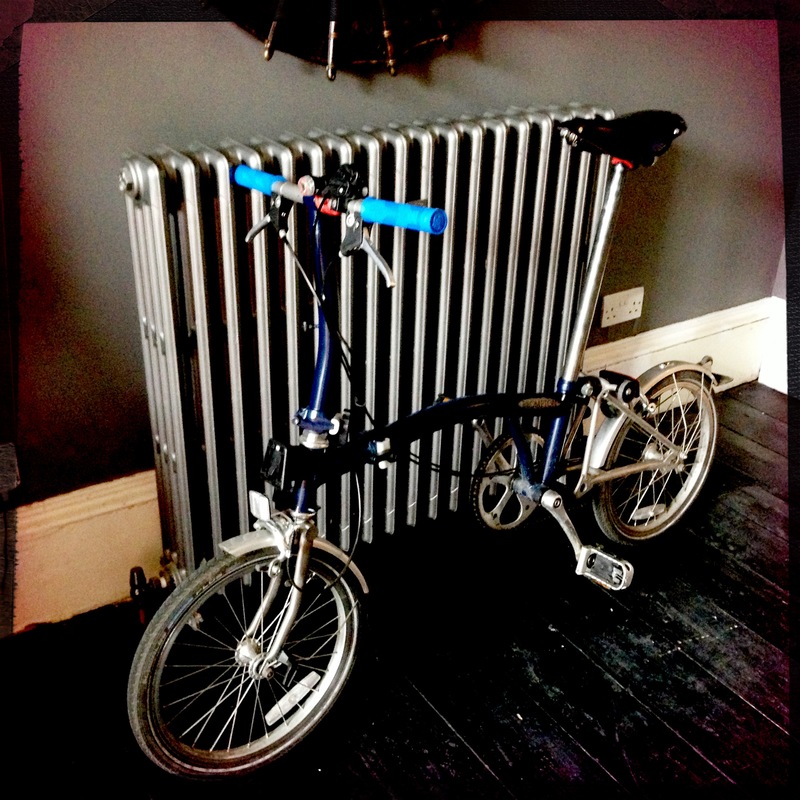 They are everywhere and no wonder – they make perfect sense as they are portable helping integration with public transport and more importantly they fold small – perfect for a city where rents are extortionate, space a premium and where a 3 bed flat can easily set you back by over a million £. 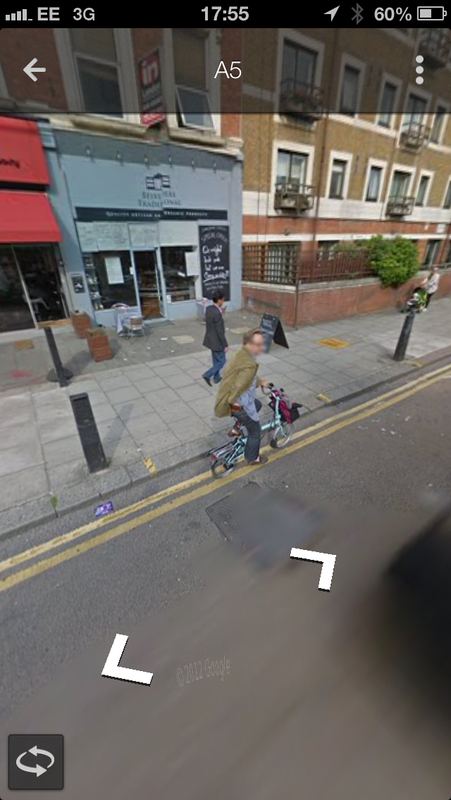 So then Looking up an address of a pub on google street view I see this another Brompton doing what it does best. Is there anything more appealing to the eye than a well-crafted titanium frame? 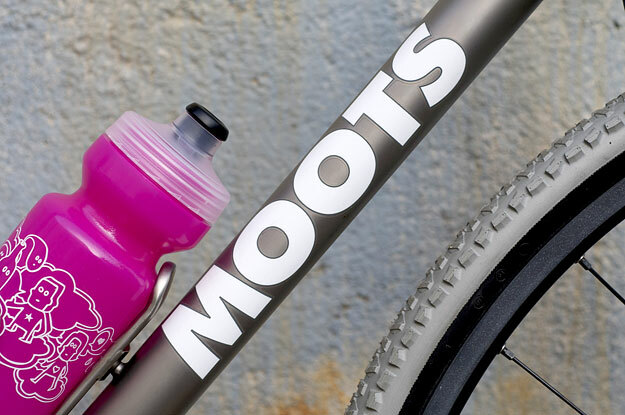 Moots have been assembling frames from American-made tubes of ti, all with those perfectly spaced beads of filler, since 1981. 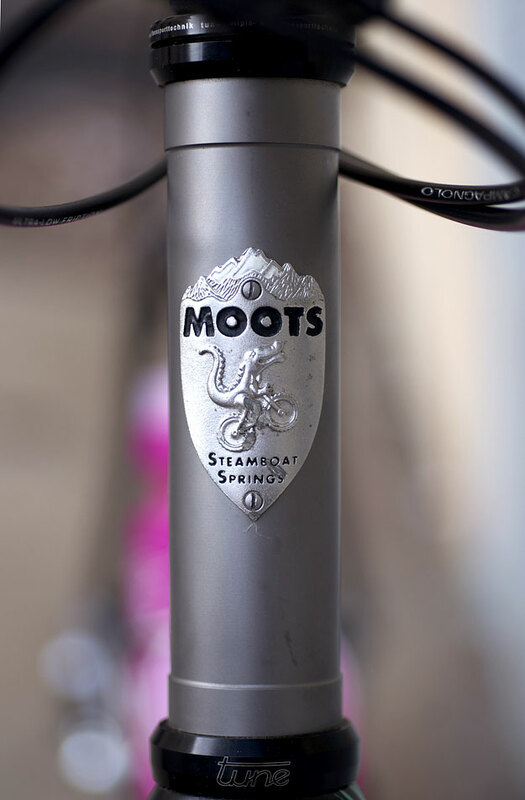 A Moots frame is a work of art in itself, but this Psychlo X has been embellished byJustin Bauer, an LA-based artist whose work makes the MOOTS look even faster standing still. 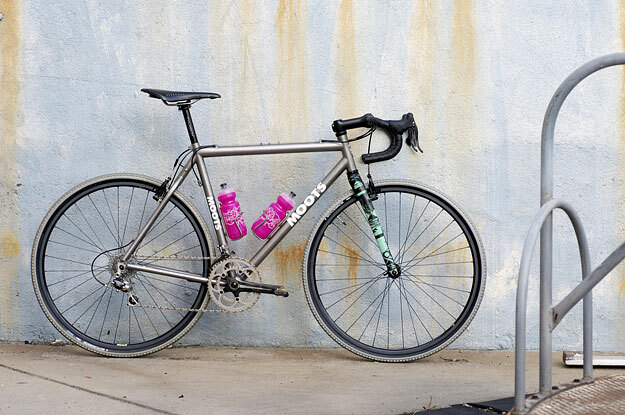 Justin’s good mate Steven Ocheltree owns this Moots, built up with a heady mix of Campagnolo 10-speed Record and Chorus, Tune, Thomson and ENVE. The Alpha-Q forks were handed to Justin for a bit of aftermarket artwork. Justin tells us about his process: “I work mainly on canvas. My work is often an exploration of motion and inertia centered around some stable concrete shapes. 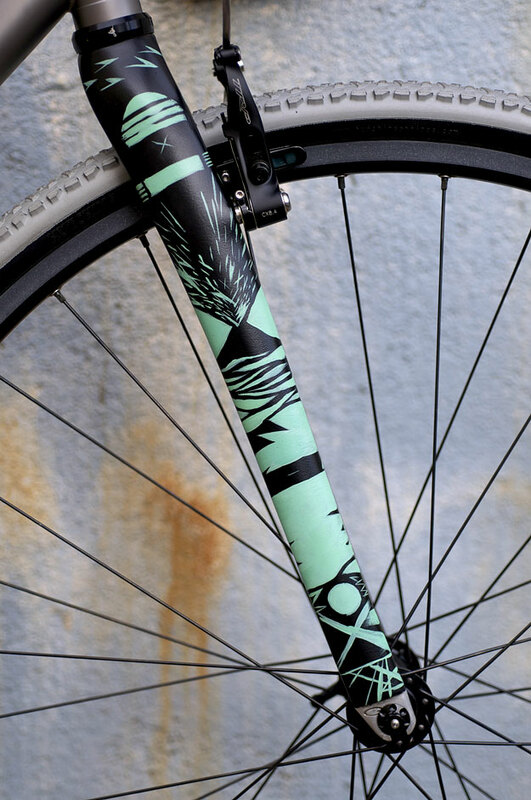 “Since I ride though, it seemed a worthy experiment to paint on the 360 of a bike fork and see how that motion would translate to something that is used for motion. 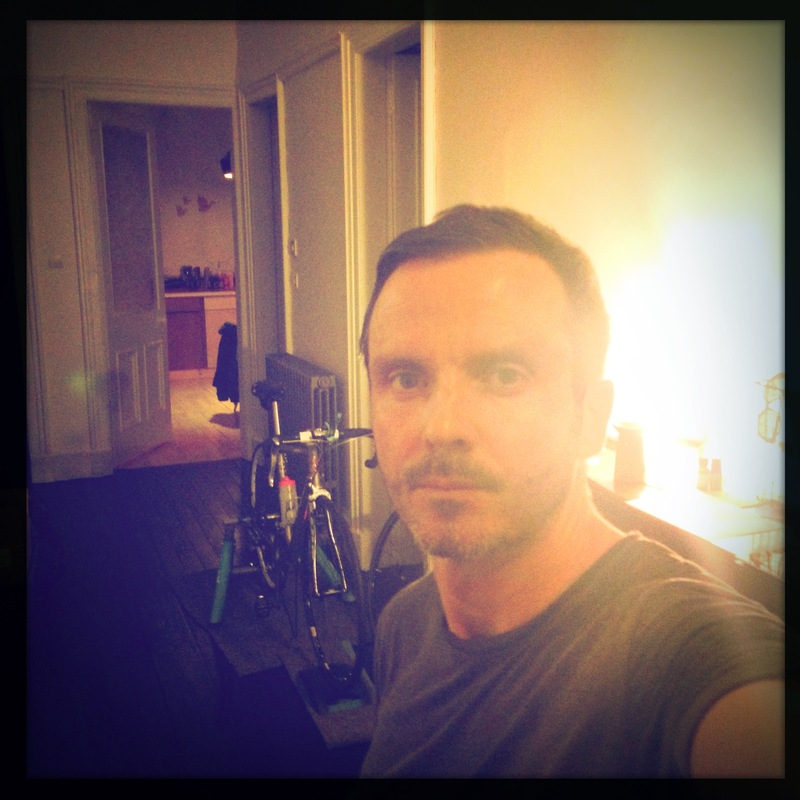 Steve was finishing up his bike so I got hold of his fork and went to town. 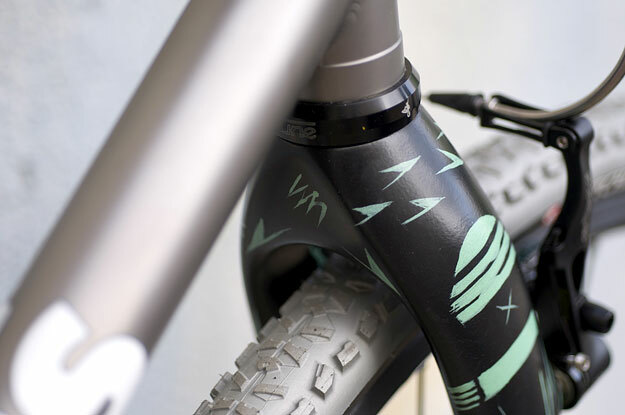 The result of painting on a practical everyday rider could end up a little over-the-top so I painted some wild strokes in two simple colors, black and mint green. 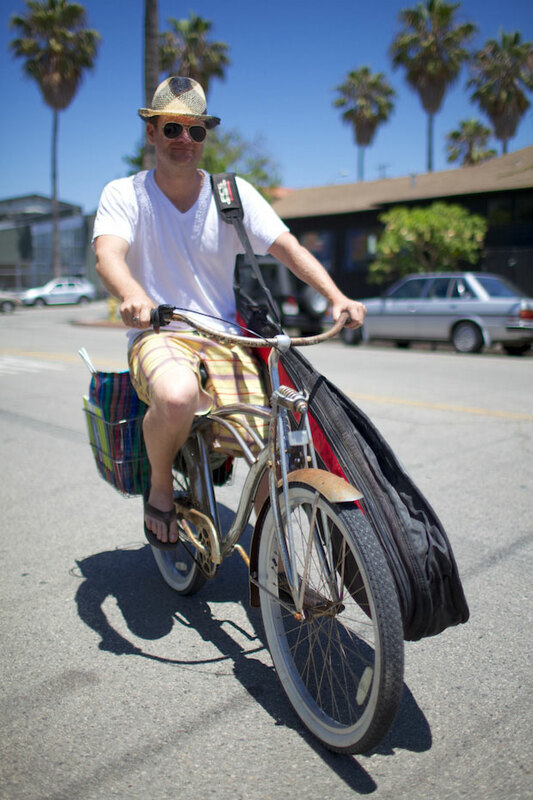 “These primaries feature on my canvasses and they still come off as tough and aggressive on the bike. I’m now working on a more conceptual series using crashed car fenders, motorcycle tanks, bike forks etc. Often an artist will simply translate work done on a canvas directly to these parts. I’m more interested in reacting to these pieces as destroyed products and working with what’s already there. Have a look through Justin’s portfolio and his tumblr, then come back to the forks he painted for Steve—they’ll really come alive. Special thanks to Steve, Justin and especially Kyle from Golden Saddle Cyclery for the awesome photography.